In signal processing, different filter types are used to pass most frequencies unaltered, but they attenuate those frequencies in a specific range to very low levels (Quelle: Wikipedia). We offer different filters for specific purposes incl. band and notch filters, low pass filters or filter banks. Please refer to the section Filter Cards for more information. The single channel receiver is based on the R820T2 tuner that has the bandwidth of 22 – 1766 MHz. Up- or down-converters are necessary for signal reception outside of these frequencies. We provide an effective up-converter for frequencies below 30 MHz. Please see the section Band Extension Cards for more information. Please see the latest news to the downconverters on the rtl-sdr.com blog. The typical DVB-T receiver based on the RTL2832U chip has a frequency accuracy of ± 30 ppm and depends on the environmental temperature. This tolerance is sufficient for TV-tuners but insufficient for many other applications in the SDR-area. We offer different modifications of the Clock Card that provide a temperature-controlled crystal oscillator (TCXO) with tolerances of 0.1 ppm, 0.5 ppm, 1 ppm, and 2 ppm. Moreover, we have developed a special HF-adapter that enables distribution of an external clock to the single RTL2832U receivers. Sometimes, there are situations where the dongle sensitivity is insufficient to decode weak signals. Such situations can arise not only due to weak signals but also due to losses in the long antenna feeder, losses in the filters utilised, as well as due to industrial interferences that lower the signal/noise ratio. In most cases, the aim is not only to amplify the weak signals but also to improve the signal/noise ratio. installation of the LNA (not optimal but suitable solution) which provides the amplification of the input signals in the high dynamic range and has good alignment with the antenna feed. We discuss the requirements in our blog post Increase receiver sensitivity and calibration and provide our solution to this problem with the Antenna Amplifier and Switch Card. 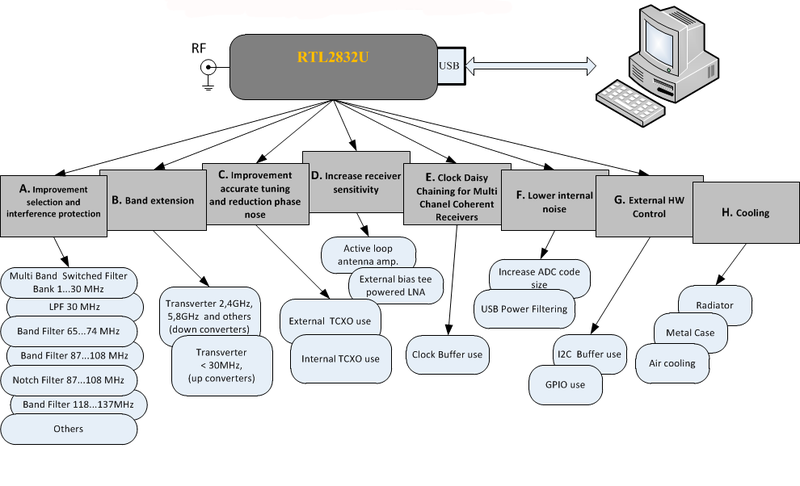 Clock daisy chaining is an interesting research topic for multi channel coherent receivers. We offer different types of coherent receivers (e.g. 4 channel entry level) or provide different cards for clock synchronisation, e.g. clock card. Many users have additional requirements for the hardware management of their peripheral devices, e.g. step motor, sensor information reading or writing, etc. The receiver can provide additional hardware interfaces, leading to the unnecessary usage of specialized boards or external PCs. Currently, our Clock and Expansion Cards support an 8-bit register, but we can develop a custom design for any components necessary which use the I2C-interface. Did you know that the world consumes more energy for cooling than for heating? The tuner R820T2 and the RTL2832U chip are hot chips that reach temperatures above 70°C in a plastic case. There are different cooling solutions from simple aluminium-case enclosures to special software adaptations for the tuner. Currently, our contribution against climate change is an Electromagnetic Shielding Cage that provides a more efficient cooling due to holes and an electromagnetic shielding against the interferences.